a gorgeous litter of 6 standard f1b Labradoodles born November 11th. Based on their 63 pound Labradoodle mom and 54 pound standard Poodle dad, we expect this litter of puppies to be 50-70 pounds fully grown. These precious f1b standard Labradoodles are friendly, cheerful and sweet! We believe they will make outstanding family members for a few fortunate forever homes. These pups are available for pickup at our Greenville, SC partner home (SC sales tax applies). If you have the pup delivered outside the state of SC, there is no sales tax. You can have us hand deliver the pup (drive it to you) for 70 cents a mile, or have a personal pet nanny fly the pup to you (pup will always be in the passenger compartment). Typically our puppy nanny service costs $400-600 total. Darlene is a lovely Labradoodle with a gorgeous blend of caramel and white in her coat. She loves to play outside with her siblings, and she is gentle, loyal, and affectionate. She’s a great pup, and we think that she will be a wonderful companion! Jewel is a cute Labradoodle with a wonderful personality. She is a gorgeous girl with a red coat and is loving, cheerful and great around kids. Jewel loves to snuggle up to us at nights, and we will miss her! Lennie is a bouncy and happy Labradoodle. He has a gorgeous red coat. His tail has a big, wide wag, and he loves to play around the yard. We think that Lennie will receive lots of compliments for his gorgeous coat and friendly personality! Max is a sweet little guy that has a huge heart for people. He loves company and he especially loves being held and petted. We love his white markings and curly apricot fur; he is a great looking pup! We know that he will make a wonderful family member! Rex is a handsome little parti-color Labradoodle guy that loves to play. He is fun-loving and can regularly be found in romping around with his siblings. Rex is super loving and very loyal, and we think that he will be wonderful for an any family or individual. 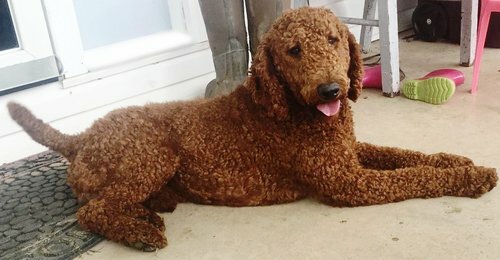 Roman is a gorgeous Labradoodle with a thick, red coat and a wonderful personality. He is so much fun to be around and always finds a way to make us smile! Roman is super smart and loving, and we are confident that he will be his family’s new best friend!